JPMorgan Chase has a “community support” page entitled “The Way Forward.” It features a report by JPMorgan executive Michael Cembalest on the credit crisis called “The Big Dig,” which tries to argue that bank lending has actually increased during the credit crisis. Many more accomplished people than I have debunked this myth in the past, but I couldn’t let this pass. throughout, while securitized markets collapsed. 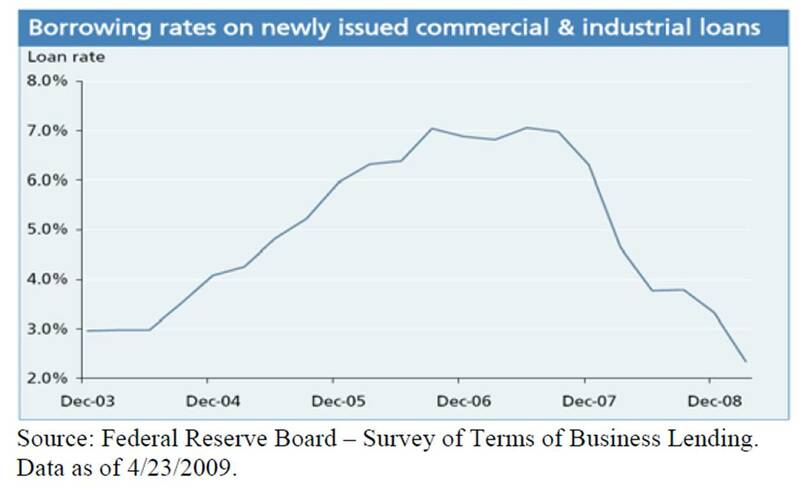 Besides the blip in Q3 2008, the picture is pretty simple: we have a steady decrease in bank lending from the beginning of 2008. So what happened in Q3? Well, as anyone at JPMorgan should know, JPMorgan acquired the assets of Washington Mutual. Washington Mutual was technically a thrift, not a commercial bank, so its assets were not counted as commercial banking assets . . . until September 25, 2008, when they became JPMorgan’s assets. At the end of Q2, Washington Mutual had $310 billion in assets, of which the vast majority counted as bank credit. 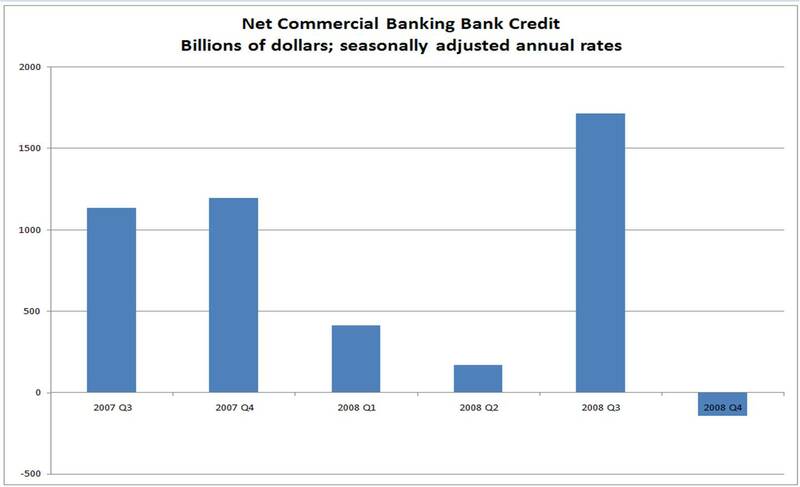 So $300 billion of the “new” bank credit in Q3 was just the result of WaMu’s collapse. Since the chart above shows annual rates, that accounts for $1.2 trillion, or over two-thirds of the total for Q3. What else was going on in Q3? For one thing, many large banks were forced to move assets from their off-balance sheet entities onto their balance sheets, which caused one-time increases in “bank credit.” There is also $100 billion in “open market paper” ($400 billion annualized), which includes both asset-backed and regular commercial paper; this line that had a value of exactly zero in all periods back to 2004. Looking at the table for open market paper, it’s clear that everyone else (money market funds, mutual funds, etc.) was dumping open market paper, so most likely the banks (who issued a lot of the stuff during the boom) were forced to keep it on their balance sheets. 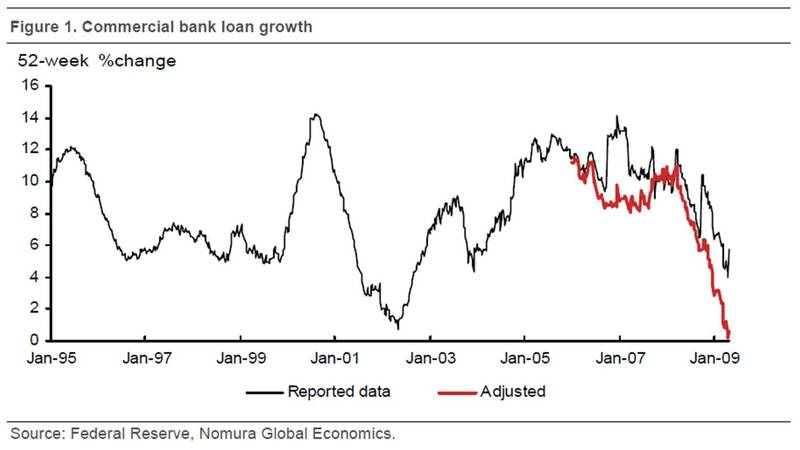 In short, the increase in bank credit in Q3 – without which Cembalest’s chart would look very different – was due to exceptional items that were a product of the credit crunch, not any actual increase in bank lending. Note the huge spike in the reported data in late 2008, which vanishes in the adjusted data. Note that the decline in Cembalest’s chart from late 2007 to early 2009 is completely reversed when you look at loan spreads. Individuals, small businesses and large corporations finding credit conditions tight are more likely impacted by the wholesale departure of securitized loan buyers than by changing bank credit conditions. There is only so much the banking sector could have done, given the collapse of another lending market that grew to be larger than itself. Yes, you read that right. 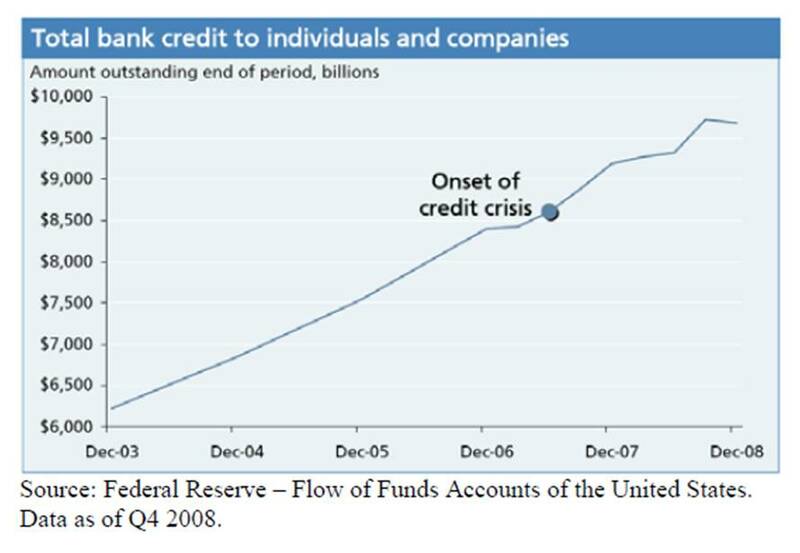 JPMorgan Chase is blaming the credit crunch on “another lending market that grew to be larger than [the banking sector].” You would think this market was created by Martians. Nowhere does he mention that the “banks” he wants to defend were major players in enhanced income funds, securities lending, and SIVs, and the big ones, including JPMorgan, doubled as broker-dealers. More fundamentally, though, it never occurs to him that the banks who manufactured these securities – who paid mortgage lenders to drum up the borrowers, who created the models that rating agencies used to rate the securities, and who went out and sold the securities to those lazy investors – had anything to do with the credit crisis. This is free-market ideology taken to the point of nonsense: there was supply (household borrowing) and demand (hedge funds seeking yield), so we were forced to sell products that provided slightly higher yield at much higher risk. It’s the fault of the “lazy investors” for not realizing they were defective products – and it’s also their fault because they stopped buying them when they found out. The major banks cranked out mortgage-backed and other asset-backed securities of increasing toxicity as long as they could until the bottom fell out of the market in 2008. When the crash came, they were unable to dump the securities they had in their pipelines and forced to hold onto them, causing a one-time increase in the “bank credit” on their balance sheets. As a result, they slammed the brakes on their lending, as documented in the Fed’s Survey on Bank Lending Practices. Trying to use the collapse of the securitization market as proof of the virtue of the banking sector is, as someone said of Kissinger’s Nobel Peace Prize, a bit much. 2 Responses to "Annoying Bank Propaganda"
JK, keep up with the excellent work to educate the American public and expose the spin/lies of big financial institutions that take advantage of the public lack of knowledge/data. Such action by the bank executive to mislead the public is extremely descipable and should be penalized. Nevertheless, policy-makers are sacrificing the American future quality/standard of living with all sort of insane bailout to save these “too large to fail” systemic institutions.